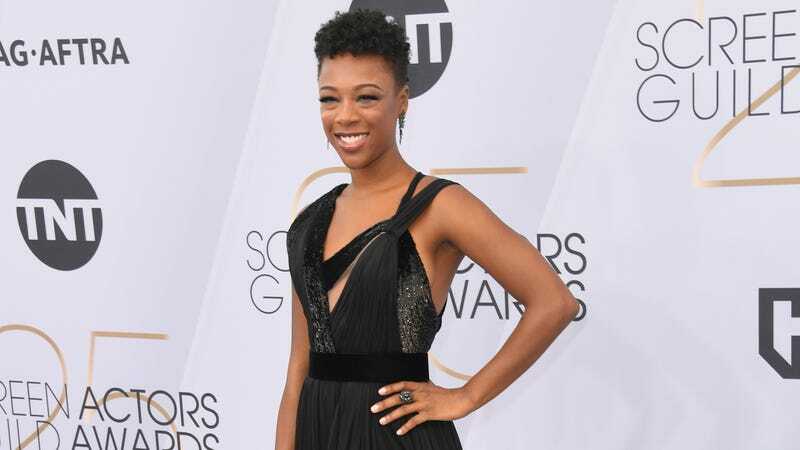 Samira Wiley attends the 25th Annual Screen Actors Guild Awards on Jan. 27, 2019, in Los Angeles. Following her successes on not one, but two hit shows in the past six years (Orange Is the New Black and The Handmaid’s Tale), Wiley has become one of our favorites to watch on the red carpet, pairing an incredible sense of style with a look that is always individualistically her. Wiley recently made her debut as one of American Eagle’s Aerie Role Models, joining Cleo Wade, Jameela Jamil, Aly Raisman, Busy Philipps, and more in the brand’s inclusive, “real beauty”-focused campaign. As she tells Glamour, her participation affords her the opportunity to represent a type of beauty she wishes she’d seen growing up. To be able to give a character like that life was something that I never thought would be possible. I honestly don’t know why I do what I do, and I can’t take something from all of the characters that I play, but I think something that I love about Poussey and admire about her is that she’s such an honest, amazing woman with amazing potential. And she’s just a really damn good friend. I think I’ve become a better friend—I return more phone calls from playing Poussey. Of course, Poussey’s wardrobe was a series of prison jumpsuits, while in her current character of Moira on Handmaid’s Tale, Wiley first donned the infamous red habit, and now, a series of utilitarian basics. So how has her own style evolved into the red carpet knockout we now know and love? These days, Wiley often relies on the always-inclusive Christian Siriano for her red carpet appearances—Siriano also designed her wedding dress. It’s an ongoing collaboration she credits with expanding her understanding and appreciation of fashion. Aerie’s mission is similar. Having already disrupted the retail advertising sector with their decision to stop retouching their models, they’ve also made a concerted effort to include all types of beauty in their campaigns, including varying races, body types, sexual orientations and abilities. It’s an inclusive approach Wiley personally responds to, because it pushes back against marginalization in fashion to reflect the world as it really is. “Sometimes it can be powerful just to say, ‘No, I’m not going change,’” Wiley said. Crossing the Lines: Are Stretch Marks Really Going Mainstream?